Walker’s is a company that puts out a line of products called Game Ear that is marketed to hunters for shooting protection, safety, and devices to help you hear when hunting. These products are so successful with hunters that many customers end up using them as hearing amplifiers for their everyday life, although this isn’t the recommended use by the manufacturer. There are a range of amplifiers to choose from in their Game Ear line from the very inexpensive Ultra Ear BTE (behind the ear) and the Ultra Ear ITC Pair (in the canal) to the more expensive Game Ear HD Elite and Game Ear HD PRO Elite all the way up to the high end Game Ear Micro Elite. 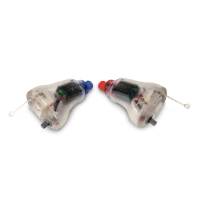 These amplifiers are different than most of the other products that we review, as they are intended for use by hunters and not as a low-cost hearing aid. Here is a rundown on the differences between the models and the best features of each. 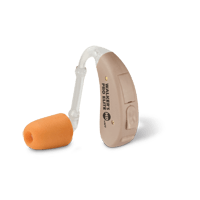 The Ultra Ear BTE is the least expensive of the Walkers hearing amplifiers. It is the behind the ear (BTE) style, and you can purchase it for as little as $15. As with most things you get what you pay for, so the reviews for this product are pretty mixed. It enhances the sound of “game” then shuts off and lets the foam earplug protect the ear when the gun fires. For that purpose, it is fine. If you want a hearing device to enhance the human voice and reduce background noise if you spend a bit more money you can get something that will work for that purpose. The Ultra Ear ITC is the in-the-canal version of their least expensive model; you can get a pair for around $30. It is also only meant to be used while hunting to help amplify the sounds of animals and to protect the ear from muzzle blasts. It gives the user the option to modify the tone and the volume for better amplification although users complain that the control is too small and doesn’t work. These are low-cost models that don’t have better quality features and parts. If you don’t mind spending the money to try them out, they may work well for you. A lot of finding the right amplifier has to do with trial and error. The price for this model jumps dramatically to around $160. What you are getting for the price is behind the ear style with one environmental adaptive listening mode that gives you 40dB of hearing enhancement. It also has a handy water repellent coating and a good toggle control. Many customers have had success with this model to help hear while hunting as well as in their daily life to help hear family members and activities like watching TV. The PRO Elite is almost the same as the Game Ear HD Elite, but you get 50dB of hearing enhancement as opposed to 40 dB, and it costs roughly $20 more at the cost of $180. It seems to be an excellent option for customers who are unable to afford high priced hearing aids. 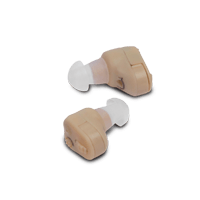 The reviews for this particular model are pretty good as far as this working for many people as a replacement hearing aid (although again, not recommended by the manufacturer). Reviewers are mentioning that they are now able to hear many sounds other than just voices, and they are extremely happy with this product. Since these devices are designed for hunters, they aren’t meant to be worn daily, although many customers do wear them as a replacement for expensive hearing aids. As with hearing aids you have to let your ears get used to them, and retrain your ears to learn how to hear. The more you wear them, the better you will be able to hear through them. Most users find the design on all of the models reasonably comfortable with the Walkers Elite HD Pro being one of the most comfortable of the models available. 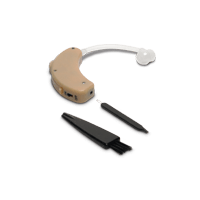 The best value for those looking for an alternative to expensive hearing aids seems to be the Walkers Elite HD Pro; users love the performance, battery life the ability and excellent sound quality for people with mild to moderate hearing loss. They also have a contact form for online help and a FAQ for common questions and problems.